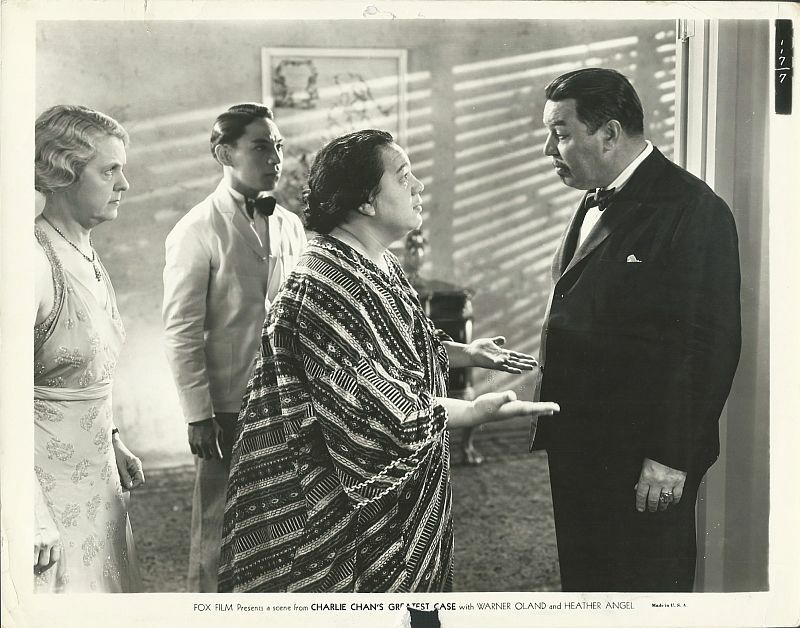 Gallery: "Charlie Chan's Greatest Case"
outside the door to his conversation with Minerva Winterslip. tonight. Humbly request patience, for though all are called, perhaps only one chosen." Winterslip, "Only make haste when catching flea." Amos Winterslip about the murder of his estranged brother, Dan. 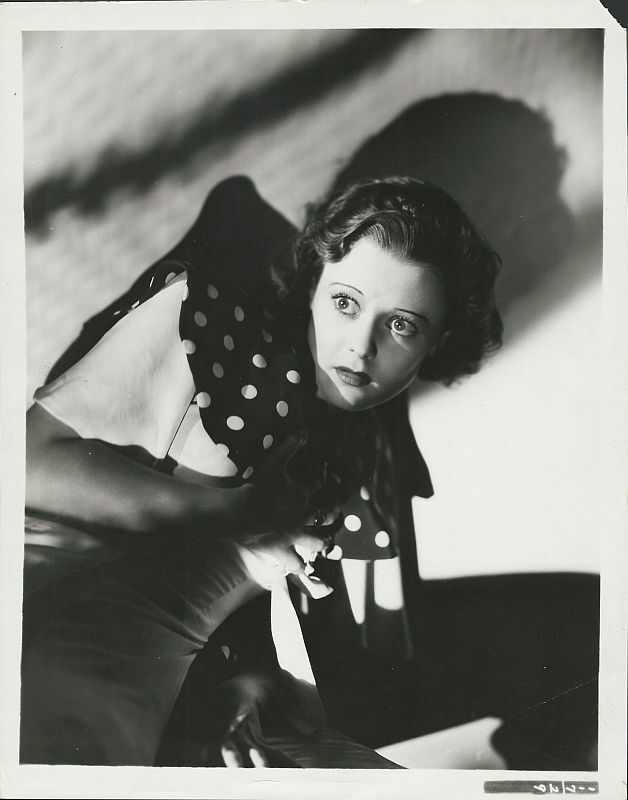 Dan Winterslip bought for her just before his murder. 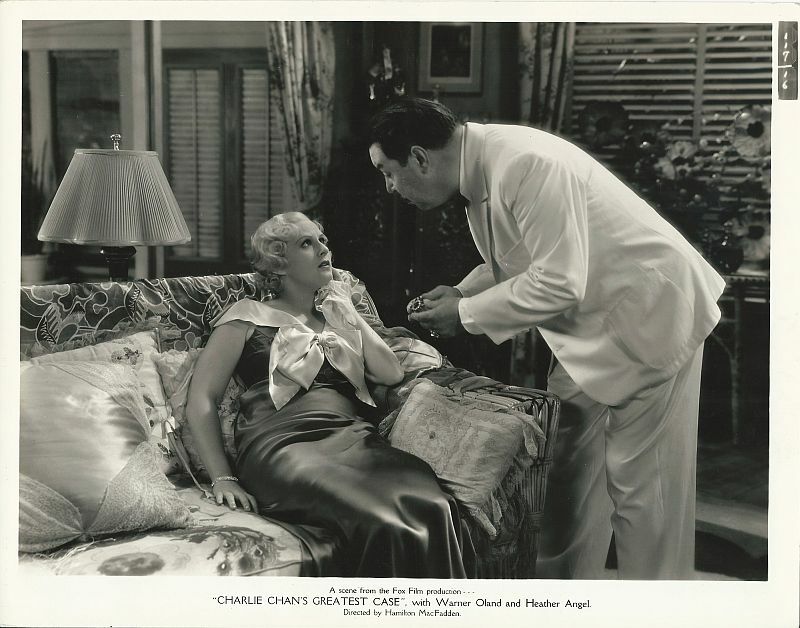 Arlene Compton tells Charlie Chan that the brooch from the late Dan Winterslip belongs to her. 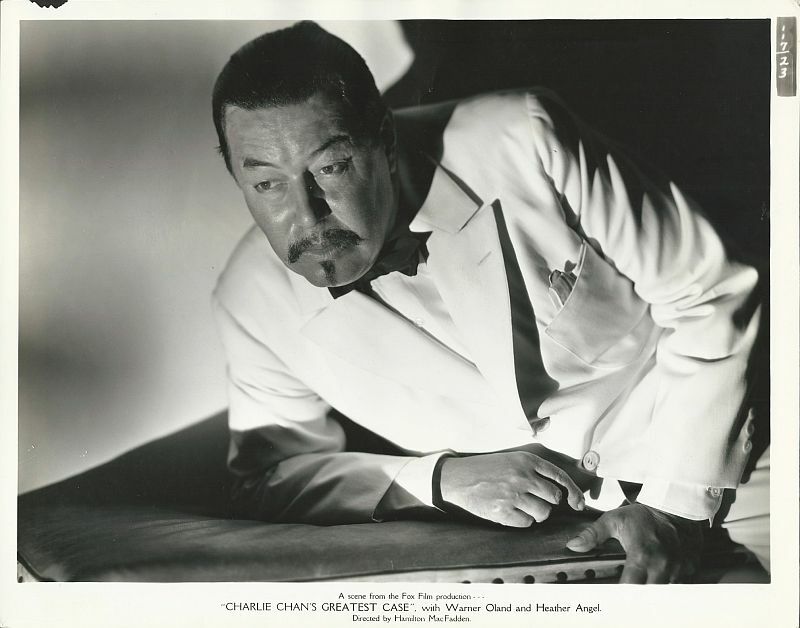 Charlie Chan seeks a clue. 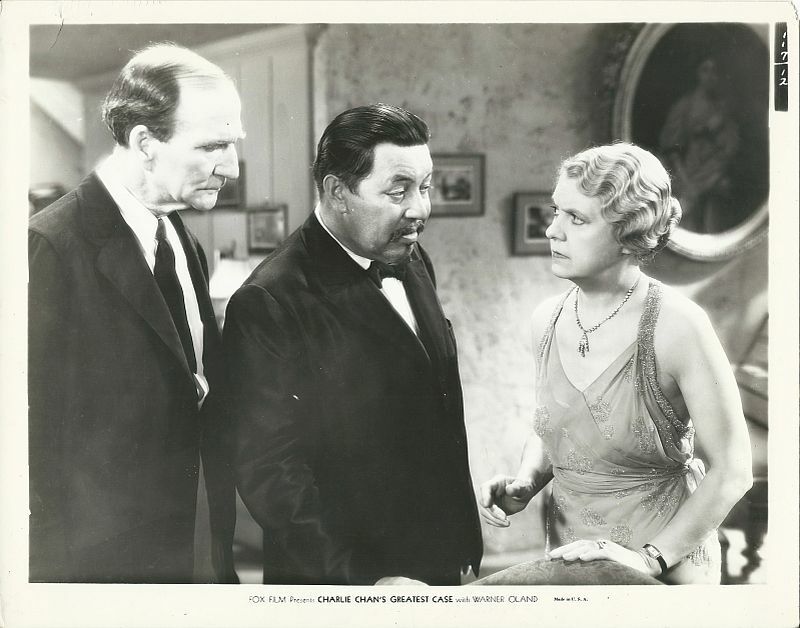 John Quincy Winterslip and Carlotta Eagan. 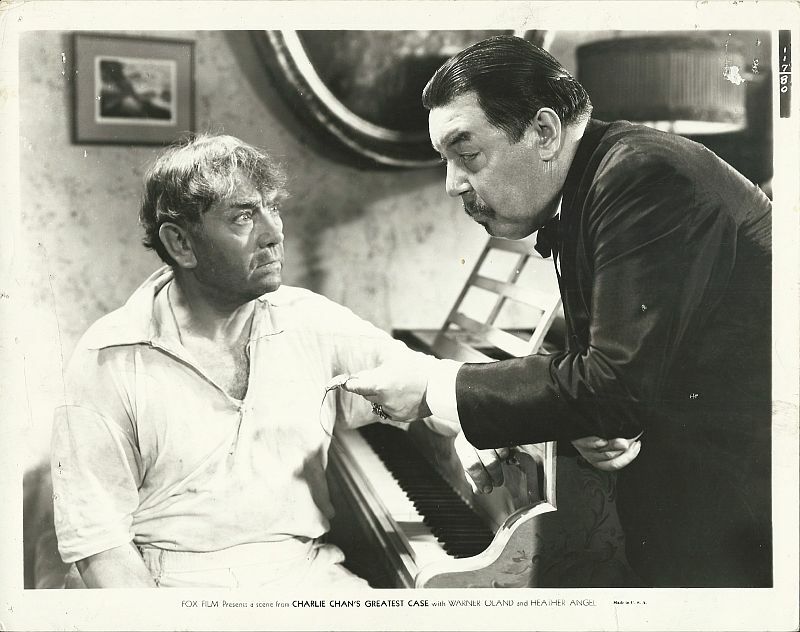 At the Reef and Palm Hotel, Captain Hallett takes James Eagan in for questioning. 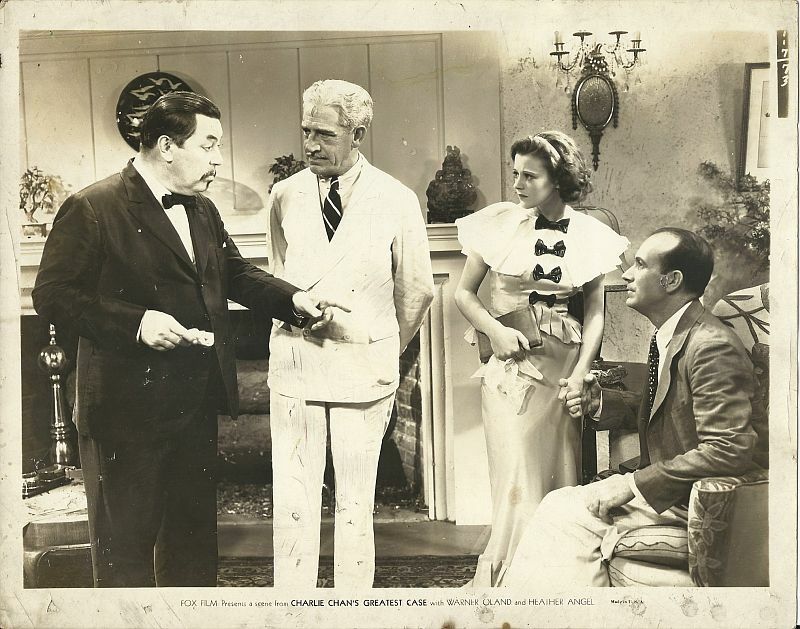 John Quincy meets Carlotta at the Reef and Palm Hotel. 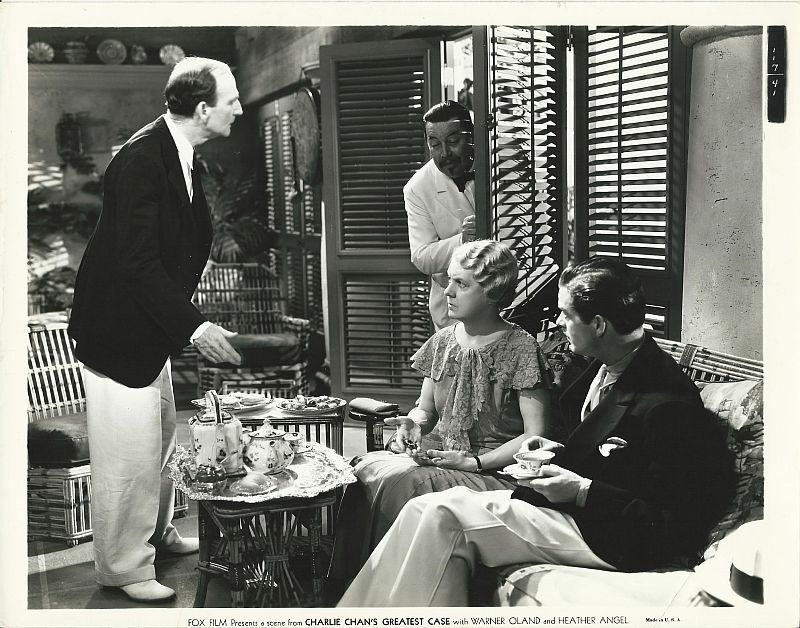 John Quincy Wimterslip with Carlotta Eagan at the beach. 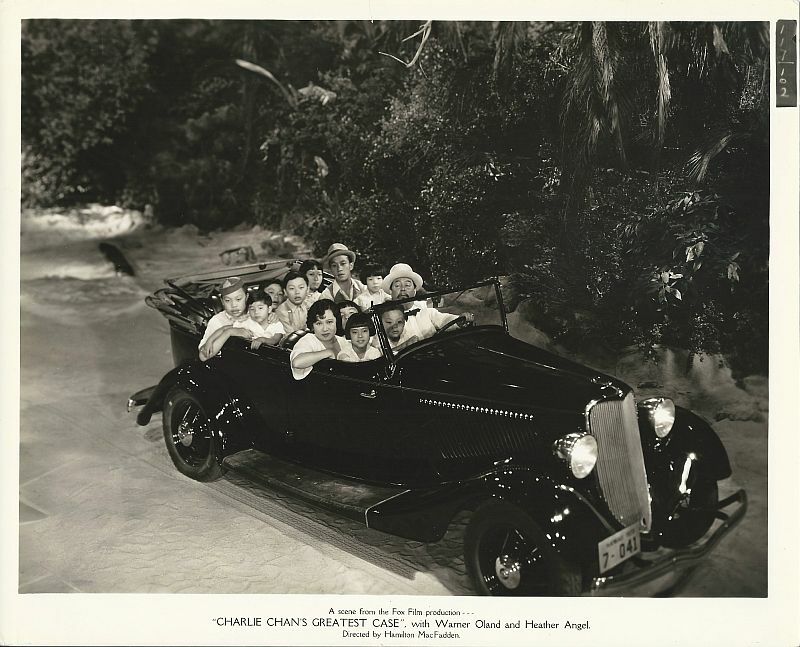 Wimterslip Carlotta Eagan hear an ominous rustle in the bushes. inspects the box that was dropped as Koahla ran off, finding it marked "TMB." 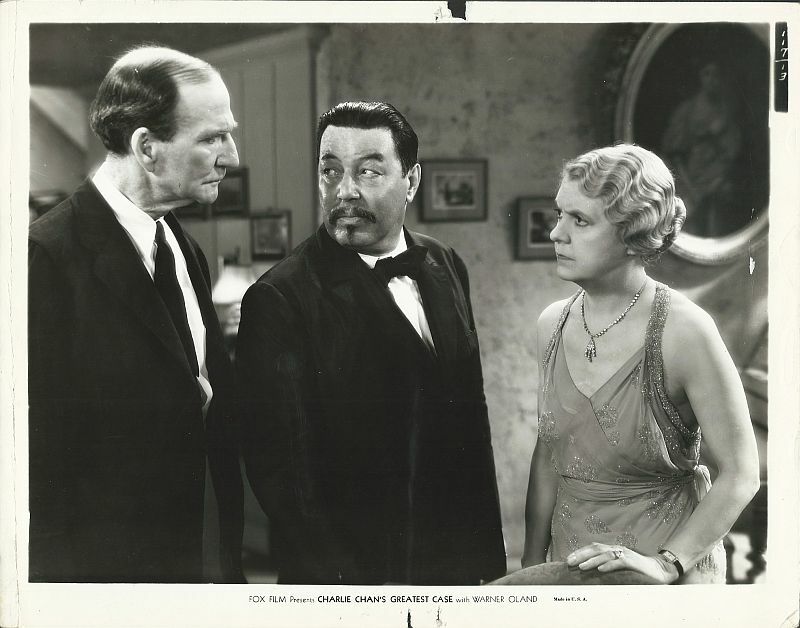 Standing outside of the Reef and Palm Hotel, Charlie Chan sees John Quincy and Carlotta. 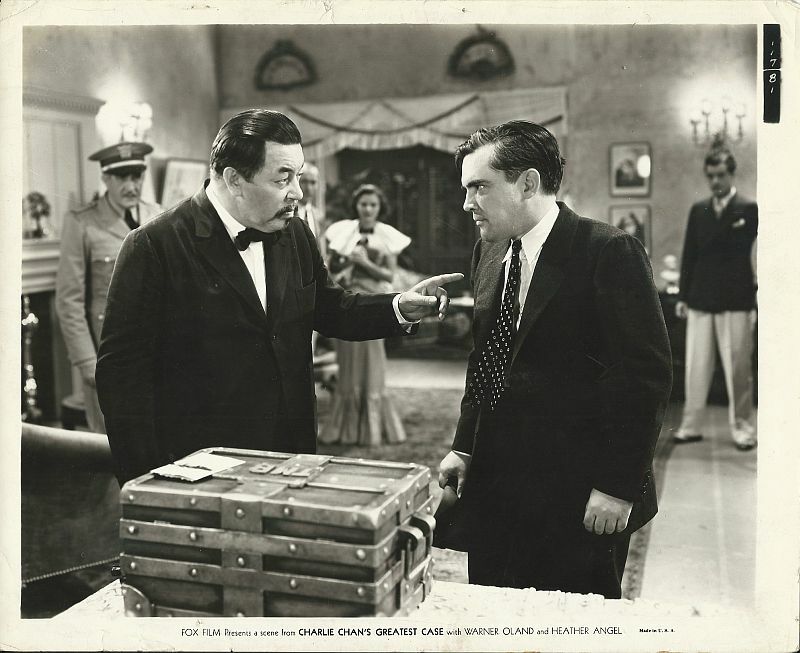 John Quincy shows Charlie Chan the box he and Carlotta recovered from Koahla at the beach. Steve Leatherbee who is among the suspects gathered at the Late Dan Winterslip's home. Compton by Dan Winterslip actually belongs to his family. 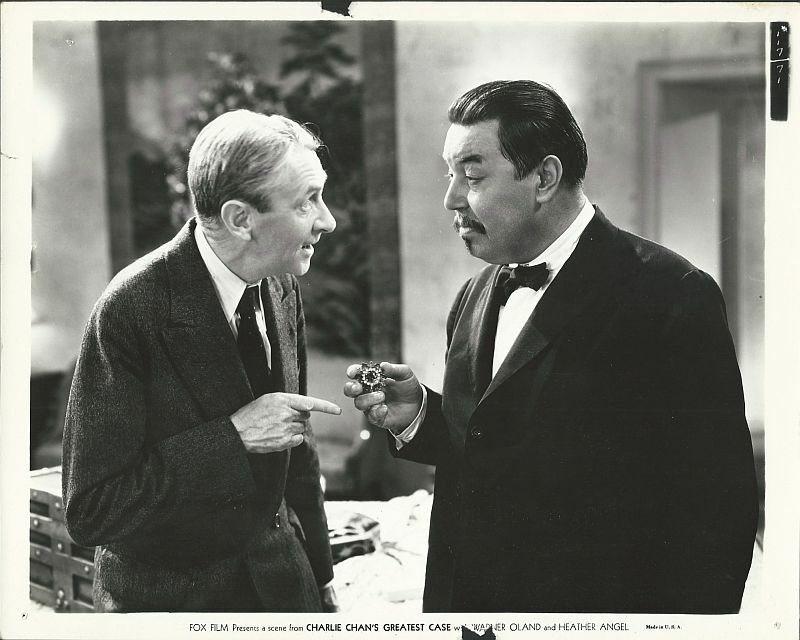 answer Charlie Chan's questions, thus bringing suspicion upon himself. 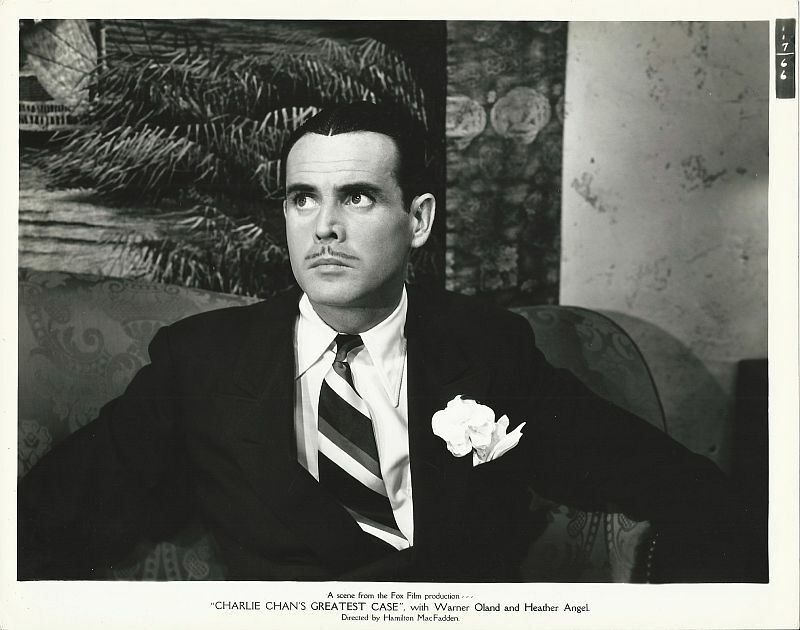 be taken into custody, prompting Carlotta Eagan to reveal her father's secret. 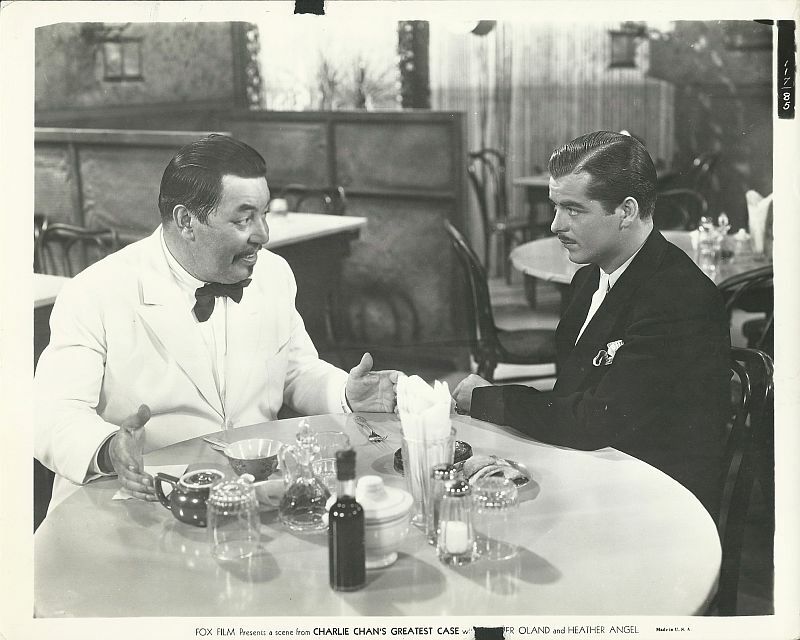 Charlie Chan asks James Eagan why the late Dan Winterslip gave him a check for $5,000. same watch that was worn by the murderer of Dan Winterslip. 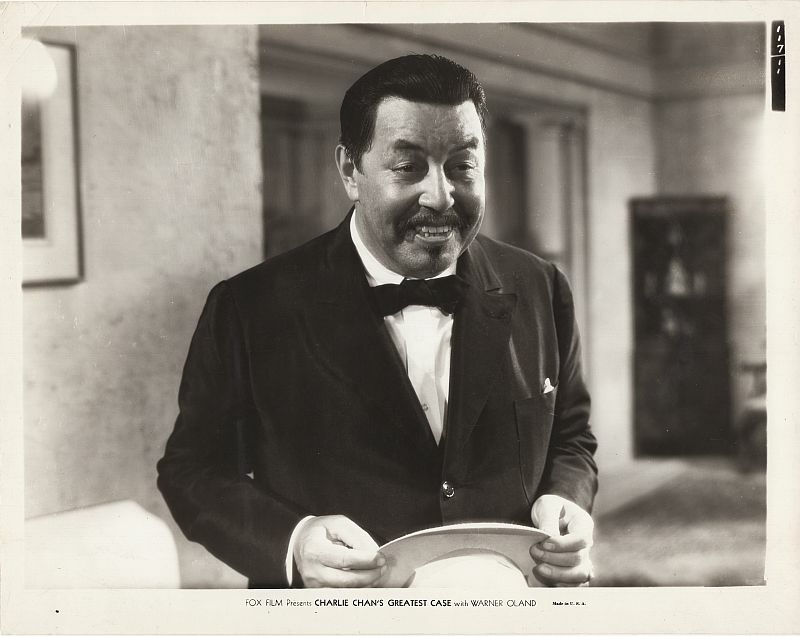 Charlie Chan states to Berkeley, "You murdered Dan and Amos Winterslip." 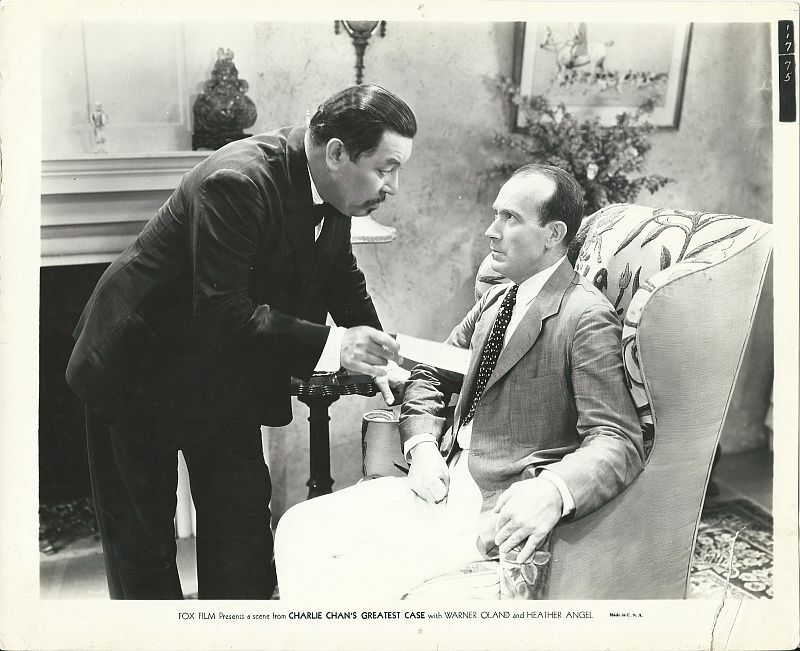 in the investigation of the murder of his uncle, Dan Winterslip. 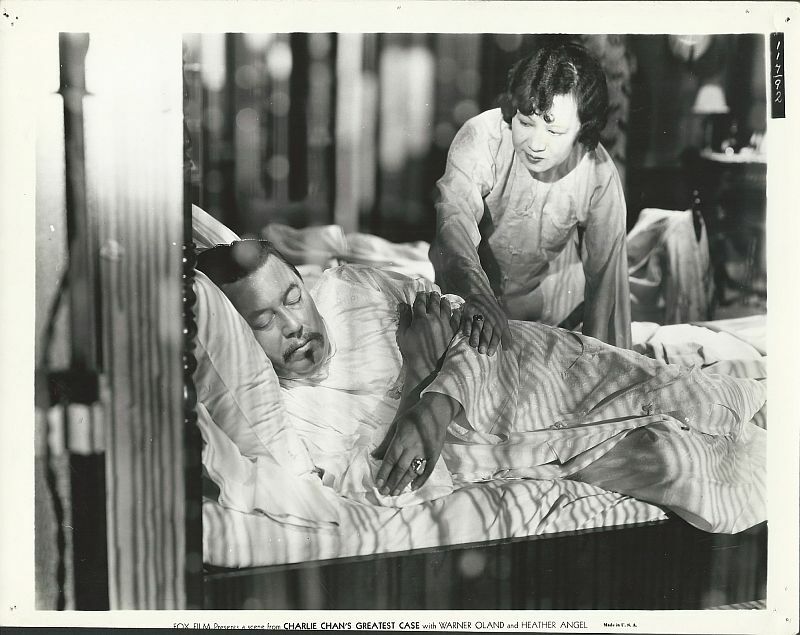 Awakened by the ringing telephone, Mrs. Chan rouses her husband. 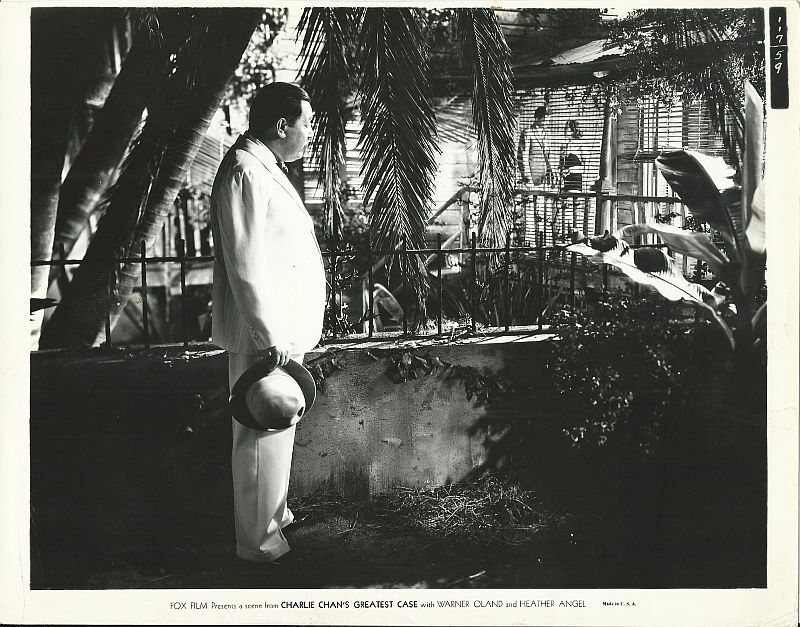 Surrounded by his family, Charlie Chan speaks with Honolulu Police Department Captain Hallett. 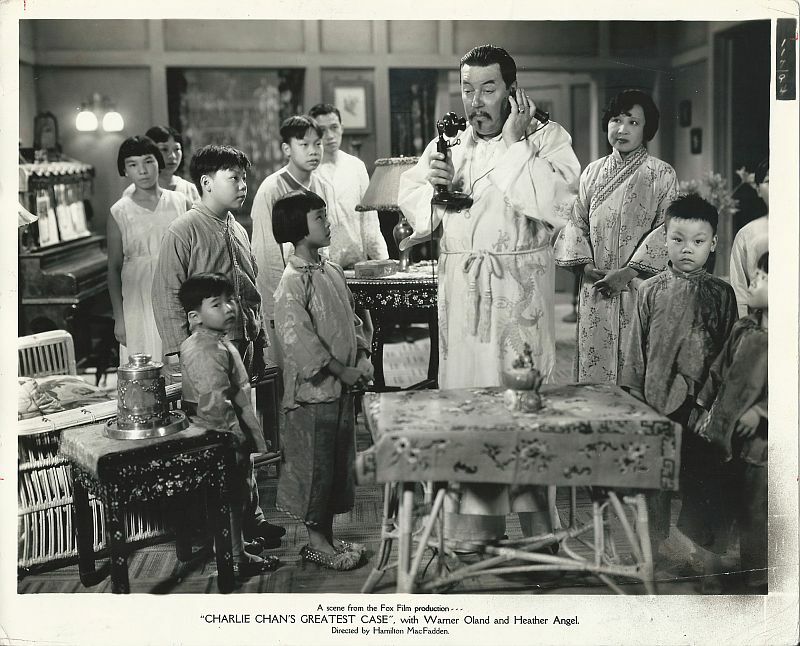 Three of the Chans' sons are awakened as the telephone rings in the middle of the night. 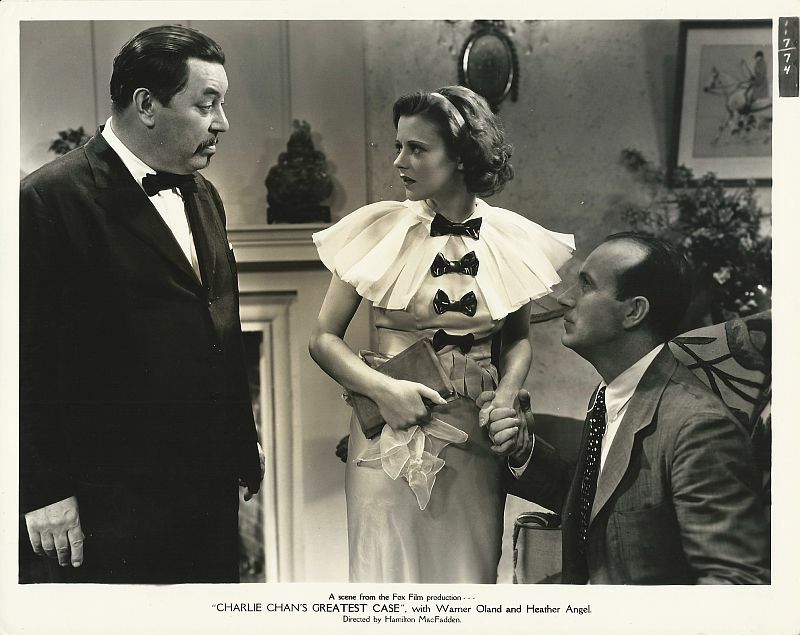 a gift to Charlie Chan from a grateful Minerva Wnterslip. 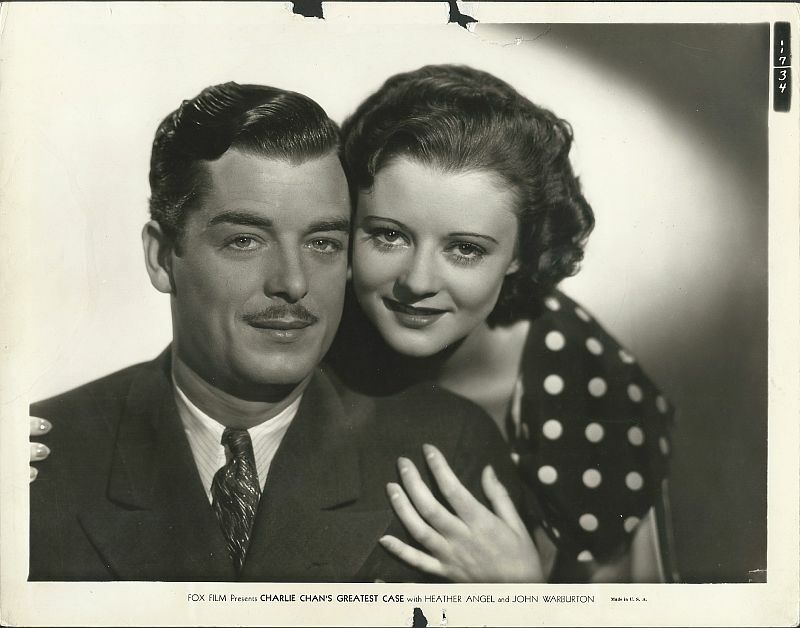 Carlotta Eagan and John Quincy Winterslip talk on a moonlit beach. 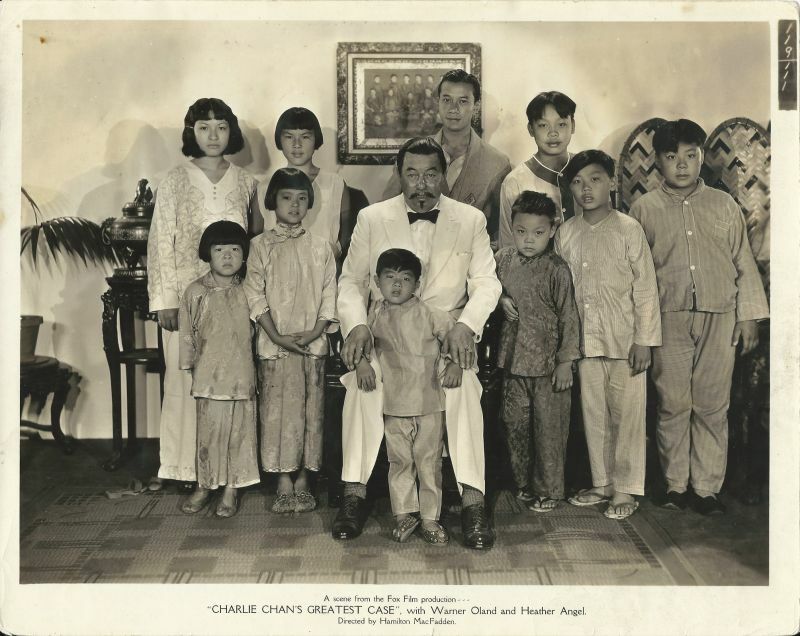 Charlie Chan at some of his "multitudinous" family in a creative depiction. 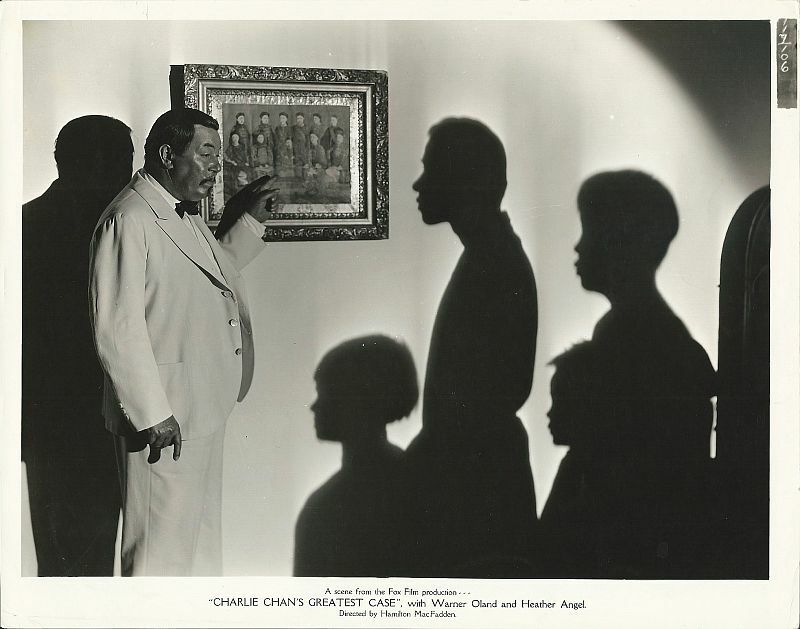 Charlie Chan poses with ten of his numerous offspring, girls on one side, boys on the other. 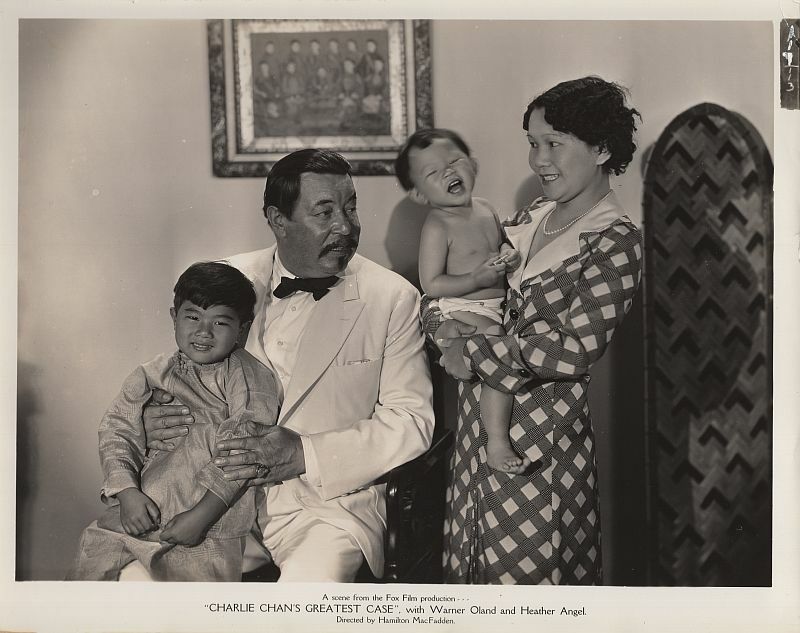 Mr. and Mrs. Chan with two of their youngest children.